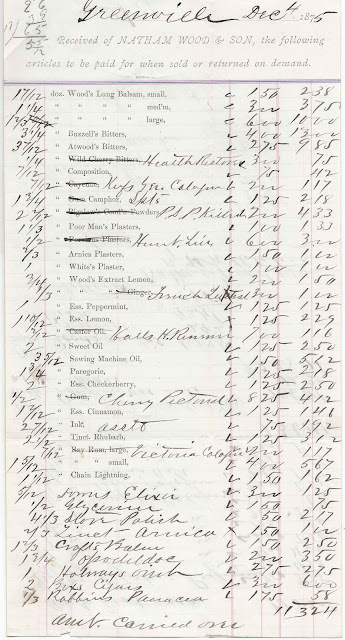 December 4, 1875 invoice from Natham Wood & Son detailing the essential oils and other commodities received at Greenville, which I believe to be Greenville, Maine. The name Natham may be a typographical error, and the name may be Nathan, as there was a Nathan Wood & Son drug company at Portland, Maine, at the time. 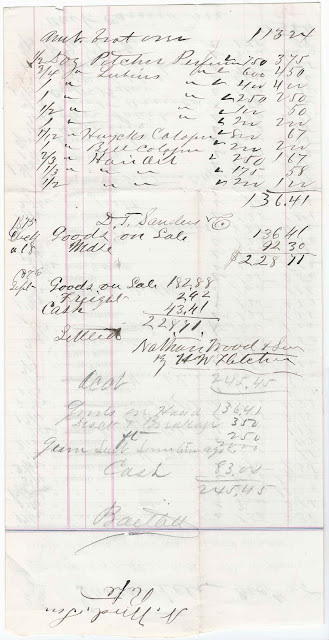 There are several handwritten names on the invoice, including D. T. Sanders, whom I believe to have been grocer David T. Sanders of Greenville, Maine; H. W. Fletcher, and the name Bartlett. If you recognize any of the names on this invoice, please leave a comment or contact me directly. 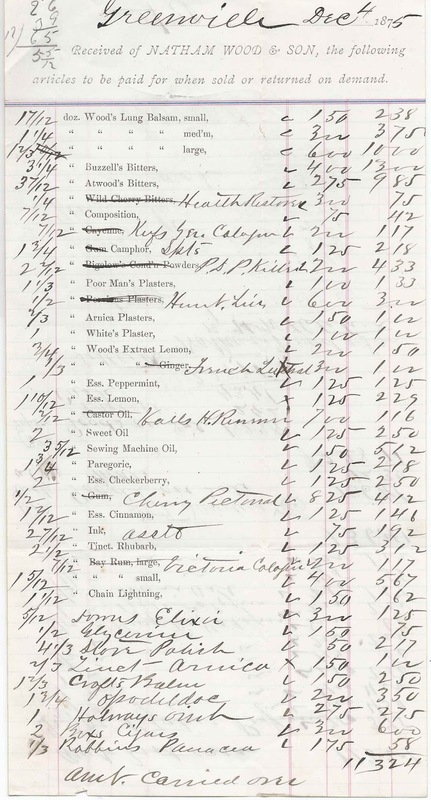 The list of items is so extensive and interesting! Nathan Wood was my great-great grandfather. His son, John T. Wood, my great-grandfather, continued the business, eventually passing it on to the last owner, my grandfather, Arthur Brooks Wood. In 1877, the company was located at the corner of Fore and Plum Streets in Portland. Later, they were in business at 428 Fore Street. After the business failed, E. Klaman had a bottle shop at the same location. Today, it is possible to purchase bottles and labels on sites such as e-Bay. Nathan Wood began his business in about 1843--as N. Wood. Nathan was born in 1812 in Concord, MA, grandson of the Revolutionary War patriot Ephriam Wood, Jr. He died in Portland in 1887. Wow - just the kind of information I was hoping for, Deb! Thanks so much - hope you enjoyed seeing the invoice.